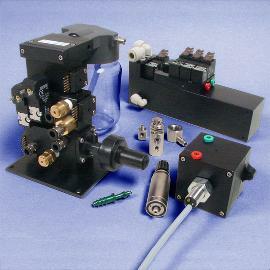 Standard and custom Pneumadyne products are used in pneumatic control systems throughout the medical industry. From small hand-held tools to larger operatory circuits, medical device manufacturers rely on our experience and expertise when integrating pneumatics into their equipment. Our miniature pneumatic valves, pneumatic fittings and custom-designed controls can be found in a wide variety of medical devices. A variety of pneumatic components are used throughout the medical device industry due to the cleanliness of compressed air in comparison to hydraulic oils. When developing custom products for use in these applications, Pneumadyne engineers can often consolidate these components into a manifold system or valve block which offers even less opportunity for system contamination. Integrating components through good design not only improves the appearance of the circuit but also eliminates potential leak points and eases system assembly. To learn more, read about the Fluid Infusion Device and Operatory Device developed by Pneumadyne which helped two medical equipment manufacturers improve their pneumatic circuitry. For pneumatic solutions you can rely on, contact Pneumadyne to discuss your component requirements. Medical equipment manufacturers also use many of our standard pneumatic components when assembling their systems. Our 2-way, 3-way and 4-way directional control valves feature a variety of porting sizes and configurations to ensure that plumbing requirements are met. Our miniature air pressure regulators offer highly accurate air pressure control in a compact package; ideal for limited space applications. Pneumatic fittings are available in a variety of sizes and configurations to connect the components throughout your medical device. Stainless steel valves and fittings are suitable for corrosive environments. Pneumadyne’s pneumatic valves and fittings can also be oxygen cleaned to accommodate application requirements. Commonly used Pneumadyne components are featured below. Review our entire product offering by clicking on the top navigation (in the gray bar).